We've also recognised that families make up a huge percentage of our charterers and that a "child fare" was only fair - onboard accommodation is $30/adult and now $15/for the under 16's. We do also recognise that the briefing can seem long (and boring) to little people and as we really do want Mum and Dad to be able to concentrate we suggest bringing entertainment for the kids - remember you're alongside so a tablet can be plugged in!! Of course you'll also be aware that we offer hourly extensions to make the most of your last day. With an extra 4 hours (hourly rates applies, see your vessel costing)you could enjoy lunch afloat and have time to stroll in by 1 for a 2pm handover. Tourism is booming in the top of the south with a record number of Cruise Ships visiting Picton – we advise all charterers to keep a look out – the biggest of them seem to fill the Sound! They add a different flavour to Picton as well with an outdoor market for the day of all visits. The earthquake did however see a shake up of the insurance industry and this has forced us to increase bonds for all bareboat charters to $3000.00 The process remains the same and it is an authorisation not a charge so no interest is incurred while we hold the $3000.00. Bonds are processed as quickly as possible post-charter. Another great summer of fishing stories – the blue cod 33cm size limit is much easier to understand (the old slot system just caused confusion and we never got used to the idea that 30cms was actually legal – that's tiny!!) Kingfish and Kawahai rewarded those that were keen to try a trolling lure. The Orca made themselves known again – they are now regular visitors to the Sounds, usually in the spring – if you find a seal too close for comfort he may be just hiding!! And to see the Orca chasing the stingrays in the shallows really is a spine tingling experience. Lochmara Lodge's new underwater observatory was a great hit giving young and old alike the chance to marvel at "what's down there" without getting wet. The touch tank and classroom is also designed to increase the appreciation and conservation of the pristine waterways of the Marlborough Sounds. Lochmara really must be commended for their ecological ideals – we can all only wait and see what they come up with this winter!! Our additional extras remain popular with the dinghy outboards and kayaks giving you the chance to explore while at anchor and the rods (almost)guaranteed to provide dinner or an entrée. We also have a set of inflatable PDF's for hire now. The convenience of a slimline PDF really does mean you'll keep it on, great for when you need the freedom of movement for sailing or fishing. Regulations surrounding the moorings have been tightened with most existing moorings throughout the Sounds now due for Resource consent renewal – this is a very expensive exercise (especially as we own 8) but we recognise the real value and security that they offer our charterers. Our network of moorings includes some privately owned moorings available for a nightly rental fee and all of the Resorts provide moorings as an incentive to encourage you to use their shore facilities. Our fleet numbers remains stable with the addition of Vis-à-Vis and the retirement of Southern Endurance. She had over 30 years in charter and people were still having a ball aboard. The H28 was a very predictable forgiving yacht that has been the beginning point for many sailors – we still have two 30fters, Zachary Hicks (also with a proven charter history having been with us for a similar length of time to Southern Endurance) and Dreamtime. A Hunter 30ft she is more modern with wheel steer (giving much more room in the cockpit)and a completely separate head – we all appreciate being able to shut the door!! She also has one of the largest double berths in the fleet!!! She's already proving to be very popular. The Queen Charlotte Track is as popular as ever and with the development of the Anakiwa – Picton section (not yet completed but well under way)it will open up more options for day walks. Several sections are ideal with very obvious drop off / pick up spots. Many last season took advantage of our "Long Charter Specials" so we are running them again ......Click here to read more. or call us on 0800 101 332. "Early Bookers discount" special is running now - organise your crew, plan ahead and get the reward! Our "Early Bookers Charters" discounts we ran last season was very popular. Get 5% off any charter if it is booked 6 months ahead. this can be combined with any other discount. Start planning and save! "Return Clients discount". Compass Charters has always offered a 10% "Return Clients Discount" if you return and charter within a calendar year from your last charter with us - this wont change! Also clients who have been with us in the last 10 years receive a 5% discount on any charter. This means if your last charter with us was 9 years ago you will still get 5% off as a minimum. Return clients discounts can NOW be used in conjunction with long charter discounts. Proof of past charters with us is required. "2018 Waitangi Weekend discount". Compass Charters is offering a 15% discount for 4 day charters booked for Waitangi Weekend. We are running a prize draw this season for a weekend Boat & Bach holiday. If you book and charter with us this season you automatically go into the draw for this great prize. 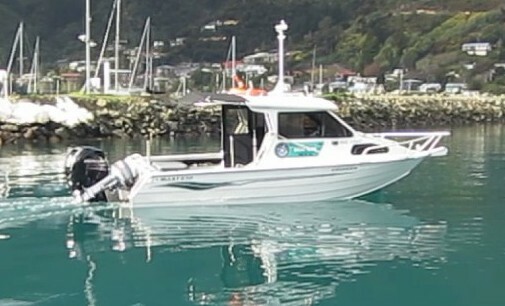 The boat is "Orion" - a McLay 650 hard top with a 150HP brand new Mercury. The bach sleeps 6 and has all the usual Kiwi comforts. The lucky client will be drawn on the 1st of October 2014 and has one year to use this great holiday. Blue Cod is Still on the menu! New regulations are on board all vessels and include a 2 cod/person/day and minimum (33cm) and no maximum size (was 35cm). The season is open between the 20th Dec and 31st August each year. We have a new runabout in the fleet. A Frewza F18 called "Morpheus". She is 5.8 meters long with a Mercury 115HP 4 stroke outboard, ski pole, colour chart plotter, fish finder, and hard top etc... A delight to drive with comfort for all when cruising the Sounds here. Surveyed for 6. "Dreamtime" - Hunter 30ft, A great family yacht! "Dreamtime" is classic Hunter yacht.It has all the systems and toys the big boat have but a lot easier to handle for the beginner skipper or short handed crew. "Dreamtime" has its new MNZ certificate and is available now and we already have a few of you booked in. Register your interest and we can put you on the list to be the first to try her out. "Vis a Vis" - Jeanneau Sundance 36ft, A proven charter boat! "Vis a Vis"is proven yacht design. many of you may know her as she has been in the Sounds Charterlink South. Now the Tony and Sue have retired she has joined our fleet so still available for charter to all those who booked her each year. A choice of 8 yachts from 29ft to 54ft - we have one for everyones budget. Now surveyed for 12 people on day trips. great corporate team building. New yacht available for luxury day trips on "Voila"! This Beneteau 54 is queen of the Berret Racoupeau-designed Beneteau fleet. A waterline of nearly 50 feet accentuates the boat's horizontal lines, giving an emphatically sleek appearance from across the water. Scallops still closed - sorry! Click herefor runabout options. Click here for bach options. Has that new yacht or launch been out of your price range? Compass Charters have 2 charters boat available to own. Let your boat work for you!